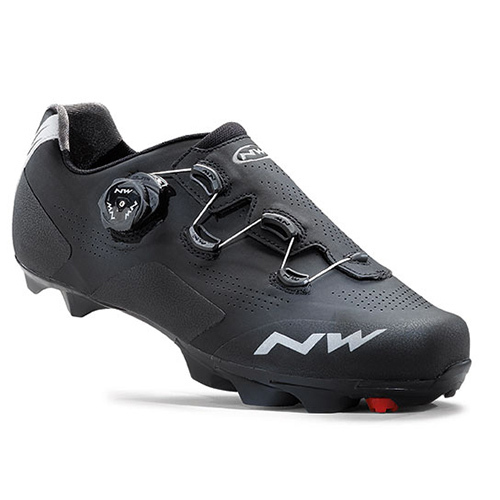 The Northwave Raptor mountain bike shoe with an insulating Thinsulate membrane has been designed to deliver comfort, warmth and functional performance in low temperatures. With thermal insulation and a snug fit the Northwave Raptor shoe not only keeps you warm and protected from the elements but is also a performance oriented shoe with a stiff sole to allow for excellent power transfer through your pedals while the aggressive tread pattern provides all the grip you’ll need off the bike in difficult winter conditions. Breathable too, when temperatures do rise slightly you won’t find yourself overheating. Fits a little large, perfect for a thick pair of socks for these winter shoes. The ratchet mechanism isn't as good as a Boa, and it takes a long time to unratchet in particular. The trick is to loosen it up a little, then unhook the string off the guide to open the shoe up completely to put them on or take them off. The Raptor TH is an almost unique product, a winter SPD shoe rather than a boot, don't like the insulation round the ankle that many winter boots possess, surely more manufacturers should produce a similar product for the UK market where the highly ventilated shoes that are prevalent on the market are often the last thing needed. I ordered a size 41, which the size chart indicated would fit me, I am normally a UK7, and I confirm they fit. So far I have worn them with a single pair of socks in temperatures down to about 6 degrees and I can confirm they remain warm so very happy with these shoes to date. At the time of purchase Merlin had the best price for a shoe actually in stock in the UK and the free delivery was within 2 days. Should be warm enough for most of my winter riding without needing to wear boots. Looking forward to using them properly but great so far.